The 19th century explorer Henri Mouhot describes in his travell narrative a game which monkeys played with a crocodile. He observed that in Chanthaburi Province, east Siam. While the crocodile remained calm in the position mouth open, the monkeys formed a chain hanging down from a tree branch, the lowest of them putting his hand into the mouth of the croc. At the moment the crocodile snapped, the monkey withdrew quickly his hand. It didn't work always, though. Crocodiles are fast and jump and sometimes it got a monkey. However, that didn't stop the ambitious fellows to repeat the 'game' another time. Mouhot didn't classify neither the monkeys nor the crocodile. 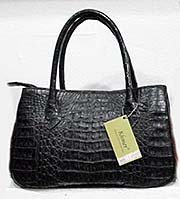 A crocodile leather handbag. This and all the images above from Siem Reap have been made in a shop with crocodile accessories in Siem Reap, Cambodia. The shop's owner also runs a crocodile farm near Tonle Sap Lake. One has to keep in mind that the animals are not kept well, that the only purpose of their life is the gain of profit for their owners, and that the crocodiles in the farm consume a lot of food. They are fed with fish, toads and snakes in great amounts. In Tonle Sap Lake that led already to a decline of local species. Feeding the crocodiles competes with food suplies for humans, endangers species and drives the food prices up. Crocodiles appear in many tropical and subtropical countries around the globe. They are a very old species, means there happened relatively little change with them within the last two hundred million years. They are related to the extinct dinosaurs; their evolutionary development split up from that of the dinosaurs about 250 million years ago. 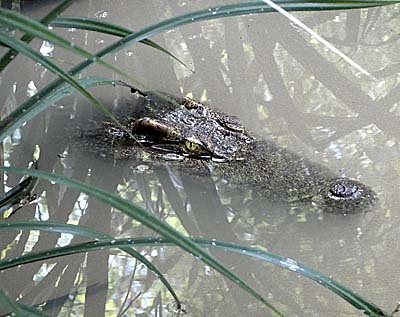 A typical behaviour for crocodiles - hidden in the water at a shore, watching out for prey. Image by Asienreisender 2012, Thale Luang, Phattalung, Thailand. Crocodiles are also the origin of the Chinese dragons, a fable animal which appears frequently in Chinese and other Buddhist temples, but also in all-day-live as wallpapers and pictures in restaurants, souvenir stalls and so on. The 'invention' of dragons dates back 2,200 years to a civilization at the Yangze River; the dragon 'long' was a first, central example in the Chinese culture. The dragon 'long' is a Chinese 'import' to Southeast Asia. 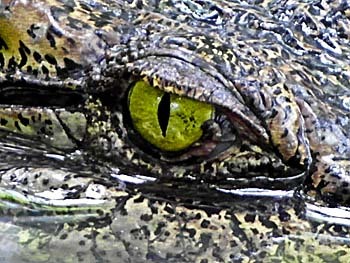 Originally the crocodile was, respectively is, revered, if not worshiped, in several Southeast Asian cultures, particularly in nowadays Indonesia and Malaysia. In the Dayak and Kayan tribal cultures on Borneo crocodiles play a role, other examples are established in east and west Timor, Luzon, New Guinea and the Philippines. Crocodiles generally played an important role in human cultural history; another prominent example is the ancient Egyptian culture, where images appear who show human-crocodile hybrides. Cultural influence of crocodiles imply generally awe of the big and dangerous animals. 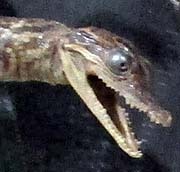 A Sunda Gharial is a false gharial and in fact a real crocodile. It's misleading name comes from his unusually thin snout, which makes him look like a gharial. They appear only in sweetwater habitats on the Malay Peninsula, Sumatra and Borneo and grow up to five meters. Their eggs are the biggest among the crocodiles. 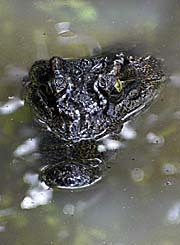 Tomistoma schlegeli is an endangered species. Crocodiles lay between 20 and 80 eggs. They build different kinds of nests. The eggs are not genetically programmed to evolve a gender. When the eggs are bred out in a temperature below 30 degree celsius the crocs will be exclusively female, if the temperature extends 34 degree celsius they will be only male. If the eggs are dug in the ground in different depths bot genders will appear. Since the crocodiles are under permanent pressure by being hunted by humans, they barely reach the huge sizes as they did in the past. That's between 1,20m and up to more than 6m length. Fossils of extinct kinds of crocodiles show that they reached up to twelve meters; the largest reported crocodile ever hunted extended more than eight meters. They grow over their whole live, but in an decreasing speed as older they get. Their physical structure is perfectly adapted to a live in the water. 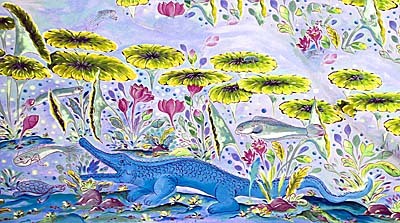 The grand lizards feed from other animals, smaller and bigger, particularly fish and other lizards, but also land animals as mammals and birds. It happens not seldom that adults eat their own kids or juveniles. When they caught a bigger land animal they squeeze it with their teeth and drown it in the water. They spin around themselves with the prey in their snout to tear parts of it out and swallow it. Smaller animals they swallow in one piece. Saltwater crocodiles can even kill water buffaloes; then some crocodiles attack together. As adults the crocodiles do not have natural enemies exept humans, but as youngsters they can become the prey of bigger birds, wild pigs, other mammals as tigers and more wild cats, phytons or monitor lizards (varans). Humans hunt crocodiles since very ancient times. Basically crocodile meat makes good food and is an excellent protein source. In Southeast Asia and China many parts of the crocodile are used for medical (traditional Chinese medicine) or magic purposes. 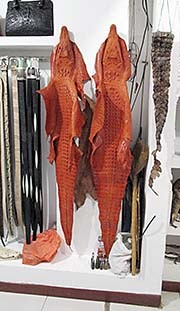 The use of crocodile leather is a relative new phenomenon which dates back to the 19th century. On the other hand do crocodiles attack humans. It happens particularly at riverbanks or lake- and seashores, for example when people having a bath and crocodiles are around. The nowadays living 25 different kinds of crocodiles are separated into three families. It's the real crocodiles, the aligators and the gharials. 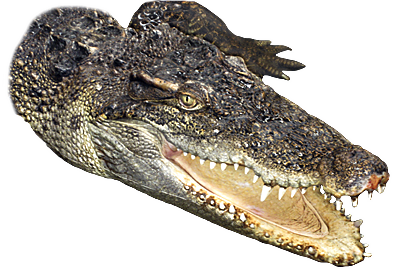 The Saltwater Crocodile and the Siamese Crocodile are both real crocodiles. There are no aligators living in Southeast Asia. The biggest species of crocodiles (and reptiles generally) is the saltwater crocodile. It's habitats were formerly streching from east India over whole Southeast Asia until the north of Australia. However, in most of these areas it's now extinct. It prefares the coastlines and river mouths, mangrove forests, rivers and goes sometimes riverupwards into sweetwater lakes inland. An example is the Tonle Sap Lake in Cambodia. 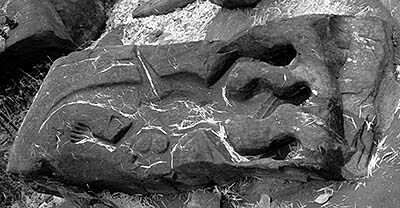 Crocodiles appear in ancient Angkorean temple images. On the other hand the saltwater crocodile is capable to overcome long distances in the open sea. There have been seen saltwater crocodiles as far as several hundred, thousand or more kilometers away from the next coast. That's possible for they can stay for up to an hour under water and live for up to twelve month without food. Their length extends to around 5m and their weight is then around 400kg, but nowadays they seldom reach that size anymore. There are reports of Saltwater Crocodiles of 6m, 8m and ten meters length; but the last size is not verified. Due to it's size, speed and the strength of it's bite the 'saltie' is the most dangerous crocodile for humans. They feed from any bigger animal they can catch. The only exception of a land mammal is the adult Asian elephant, but leopards and tigers can fell prey to the crocs. They spent their time (preferably at night) waiting by just having their eyes above the water and are barely to see so. When a potential prey approaches a river bank or shore they are able to make a huge jump out of the water, driven by their long and strong tail which works like an oar. They are also quick runners on land over short distances. Another crocodile at the bank of a pool. It's not easy to see the difference between a Saltwater Crocodile and a Siamese Crocodile, or a hybrid. 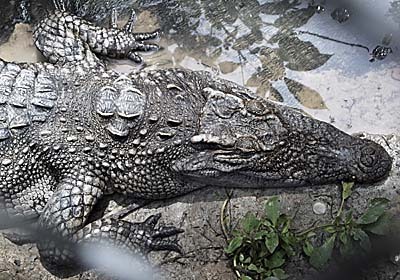 Also in captivity the crocs don't reach their maximal sizes anymore and seldom extend three meters. 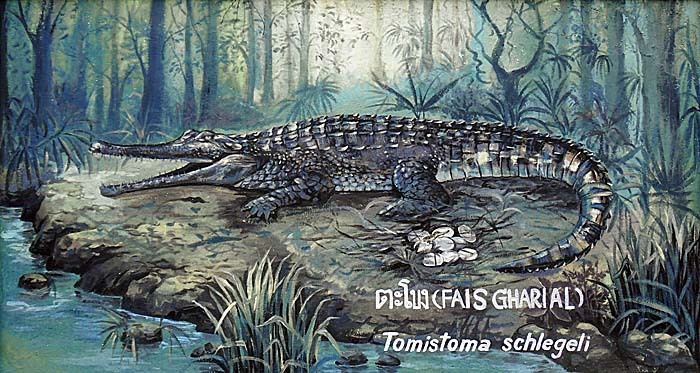 Siam Crocodiles were exclusively living in sweetwater habitats in Thailand, Cambodia, Laos, Vietnam, Malaysia and parts of Indonesia, namely on Java and Borneo. They don't grow larger than four meters and are a critically endangered species. In most places they are already extinct. 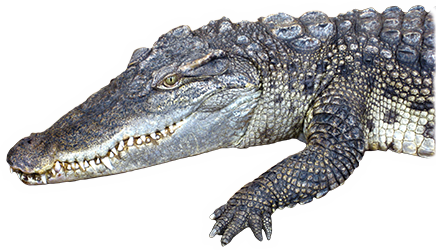 The Siam Crocodile, considerably smaller than the Saltwater Crocodile, means a relative little threat for humans. It's said unprovoked attacks on humans don't happen or are very seldom. In wildlife there are some remaining individuals of Siam Crocodiles to find in the Areng Valley (Cardamom Moutains) in Cambodia. It's supposed that's the biggest population of the species left in the world. However, the Areng Valley is under threat, for there is a new dam construction planned, although due to local resistance delayed until 2018. Maybe there are some few more remaining individuals appearing in other surroundings of Koh Kong's mangrove forests, that's in southwest Cambodia. Poaching is, besides development projects, another major threat for the crocodiles. 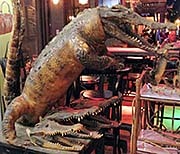 A Siam Crocodile brings several hundred dollars on the black market. 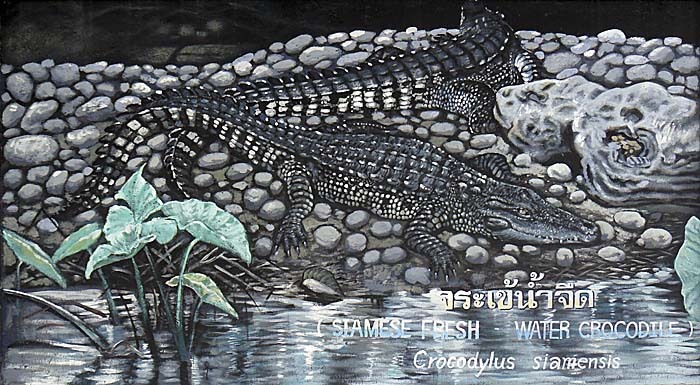 Siam Crocodiles are bred in crocodile farms in Thailand and Vietnam; their leather gains high market prices and is processed to lady handbags and other luxuries. In the farms they get frequently hybridized with saltwater crocodiles. The hybrids can breed offspring and show traits of both different species. That's a hint for the degree of relationship between both species.